Stocks managed to continue higher but how long can this last? Recent daily market action has shown that the market has been opening up lower but then working its way back up to close higher. What is significant about that? Well, the market is much different than it was years ago but in the old days, some 40 years ago, there were Specialists on the floor whose job it was to make a market when there was no buyers or sellers. These players were no different than Sears or any other retail merchandising operation. They buy low and sell high. Some would say that they even manipulated the markets and would orchestrate big rallies and sell offs. So the thinking would go, if the intention was to take the market lower, and they accumulated a volume of stock on these initial declines, they wouldn't want to be holding this inventory as they took prices lower. Thus, the rallies to distribute stock until their inventory is depleted and they can begin short selling the stock. What is important is that they are clearing out these price levels so that they can drop prices much lower without having to accumulate much inventory. So while the game may be different now, the market action reminds me of this archaic process and thus, my caution flags are raised. Other factors also provide clues to the top. The market may have filled the gap today and if not exactly, any move above today's high will definitely invite selling. This was the first price objective I was looking for and it appears that it is complete. 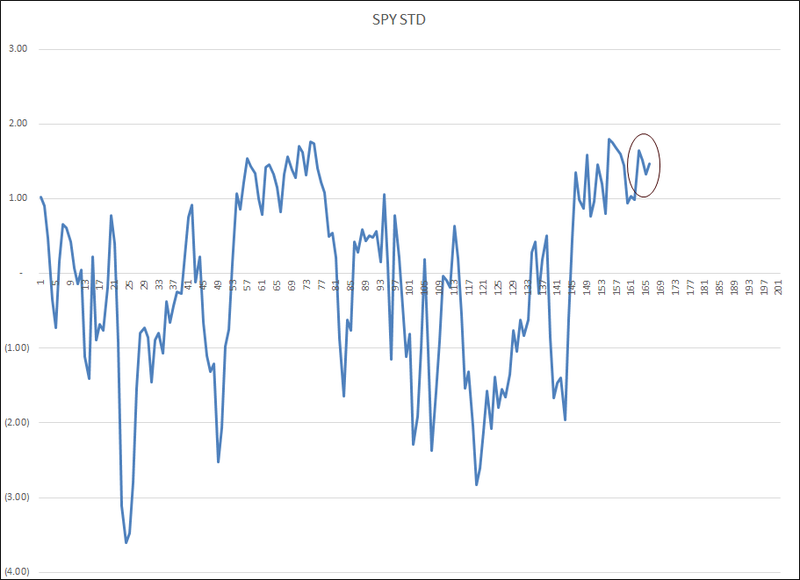 Another, not so obvious, sign is the chart of the 20 day standard deviation. Here I see a FAILED three day test of the high on the indicator. Although price made a higher high, the standard deviation appears to have topped. Today! Finally, the chart of the change in the moving average has started to break down. My bullish call started when this indicator made a successful three day test of the low. The line illustrating this bottom is still in place. Now, we are breaking through the moving average after reaching high levels reached during the last rally. Needless to say, this rally has gone longer and further than most have imagined but by now, the shorts are getting shaken severely. 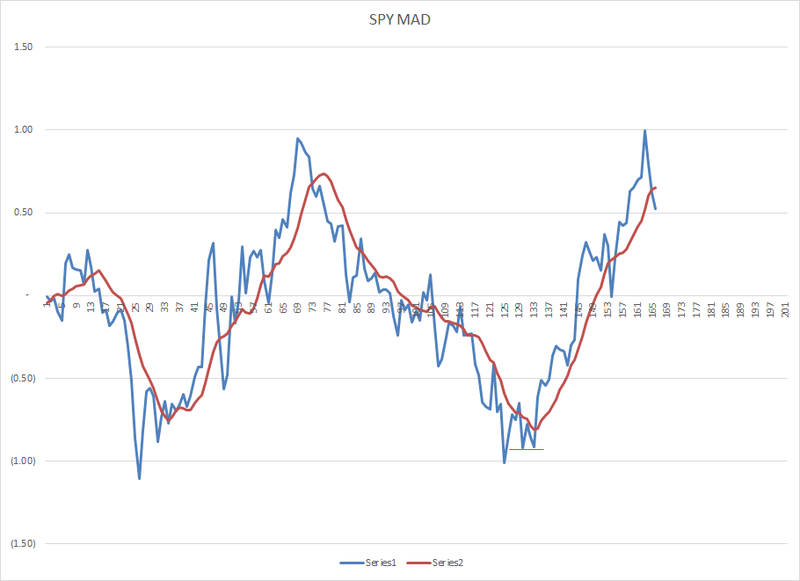 Another factor possibly hurting the shorts in the SPY instrument is that it goes ex-dividend on Friday so tomorrow might see some short covering, especially in the options market as those with in-the-money short calls will be forced to deliver the stock. Should this occur early, I will be buying some SDS, this is a 2X down instrument for the Standard and Poor's 500 index. For every 1% the index goes down, SDS goes down 2%. 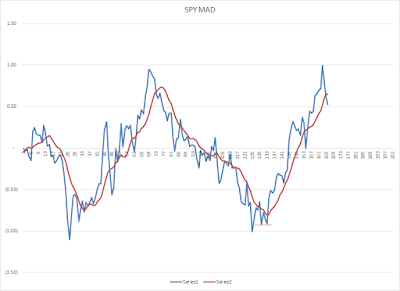 Tough calling a top here as the market as been steadily rising, but the evidence provided here leads me to believe the time might be right for a decline. 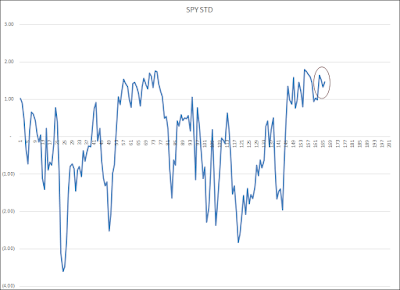 If higher prices continue, then 207 for SPY would be the next target. Excellent blog post, thank you. I currently don't use 20-day std dev, but now I will give it a shot.